Last month I tried my first gradient using textured polishes, and I really loved it. Textured polish just seems to work so perfectly for gradients. This half moon textured gradient was created by starting with a base of Pretty Serious Menace from Mars, which is a rich and pigmented, glowy red textured polish. It reminds me of Pretty Serious Santa's Sunburn, one of my favourte reds, but a textured version of it. I then used nail vinyls to mask off the half moons and did a gradient using Pretty Serious Dimension X and a little bit if OPI Jinx on the tips. I absolutely loved the look of this, but I still have to say that I'm not a huge fan of the feel of textured polishes on my nails. I really don't like the rough feel, but I love the rough look. I love this look! 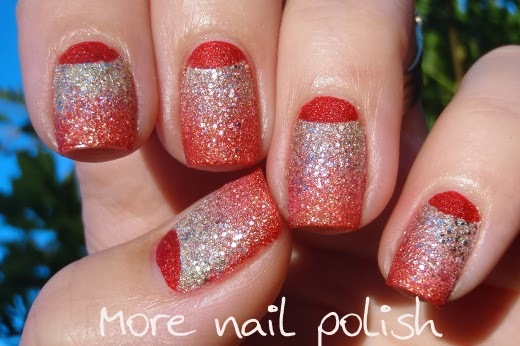 I have not yet tried the textured nail polish I have, but this makes me want to go do so! 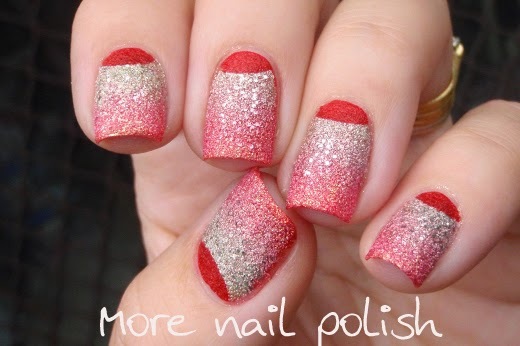 :) I like the idea of a half-moon gradient. Must try! I'm not usually a half moon-fan, but this is really cool! This is really cool, it's rare to see a red gradient and I really like it!